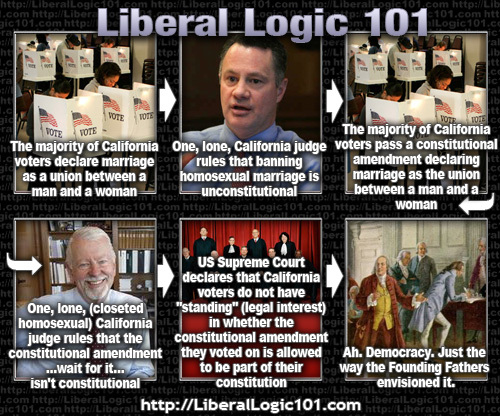 The problem is, some states have decided to insert government into marriage like it has never been before. Glenn Reynolds, one of the most popular bloggers out there, the Instapundit, has been voicing his support for the repeal of DOMA by saying that government should get completely out of marriage. But as I have said before, when the government defines marriage, it is completely in the issue. Politics and PR will now define marriage. It didn’t need formal definition before, because it was almost universally agreed that it was one man and one woman. Cultures and religions, outside of government, defined marriage. All the state did was sanction what had already been decided. Back in episode 38, I discussed this in detail, so there’s a link in the show notes if you want to catch up on that. But basically, now that states decide what marriage is, the logical end of this is that marriage will mean what anyone wants it to mean, which means it will be meaningless. Since states were redefining an already well-defined term, it fell to the federal government to bring a little order and common sense to this chaos. I didn’t like it, but didn’t see any other good way out of it. A portion of the Voting Rights Act of 1965 was struck down by the Supreme Court. The Act itself wasn’t chucked, just the way that it was determining which states came under it. The era of poll taxes and literacy tests are gone, and the disparity between whites and blacks regarding voter participation have been erased. The state with the largest gap between white and black voter turnout these days is Massachusetts, for cryin’ out loud. And in Mississippi in the 21st century, black turnout exceeds white turnout. But the VRA was still punishing the South for race disparities in voting that have long been remedied. So then, is 50-year-old data better than current information when trying to determine who should come under the Voting Rights Act? Have we learned nothing from the mistakes of the past? The four liberal Supreme Court justices, Attorney General Eric Holder, and President Obama would answer No to both those questions, at least based on the outrage they feigned over the ruling. They can’t seem to bring themselves to believe that progress has actually occurred. Or they’re pandering to their base. Either way, to call requiring these stats to be updated “turning back the clock” is cognitive dissonance of the highest order. The request is that the clock be turned forward, and Democrats are against it. Or they are pretending to be against it, and hoping that their base isn’t paying attention. If you are a Democrat, and you’ve wondered why Republicans are often wary of laws that try to remedy sins of the past, this is exhibit A. Here is a law trying to do such a thing, but it’s stuck in the culture and racism of the 1960s, and any attempt to acknowledge repentance from those sins is taken, by liberals, to be just as bad. And if you want to take politically corrective legislation like the Voting Rights Act and update it for today’s reality, you must be racist. Ronald Reagan quipped that government programs are the nearest thing to eternal life we’ll ever see on this earth. But the Supreme Court didn’t do away with the VRA, it just said that it should be relevant. Those politicos that spoke out against this eminently reasonable decision are, in my mind, just as irrelevant as 50-year-old statistics. Comments Off on Marriage "Equality"
So let me digress for a moment. Spiritual? What is that? In the introduction to Dimitru Staniloae’s book (Orthodox Spirituality), it is pointed out that in the Eastern Christian doctrine, your spiritual life and its tending is perhaps better translated as your ethical life and its care. Spiritual health and ethical well being are synonyms.